InvoTech Systems Inc. announced the recent upgrade of its Uniform System at the Thunder Valley Casino Resort. InvoTech Systems is the leading provider of advanced Linen Management, Laundry and Uniform Systems that integrate the latest RFID technology to increase profitability for hotels, resorts, casino operators, sports arenas, convention centers and theme parks. The InvoTech System installed at the Thunder Valley Casino Resort manages the Uniform inventory for over 2,000 employees, and the property joins InvoTech’s extensive client portfolio of RFID Uniform systems worldwide. Click here for more information on InvoTech’s Linen, Laundry and Uniform Systems. The RFID technology upgrade will provide additional cost-saving benefits by automating manual tasks that were previously required. Specialized waterproof RFID tags are discreetly attached to each uniform piece. The InvoTech Uniform System automatically tracks RFID tagged uniform pieces when issued to employees and as it is shipped to and received back from the laundry. Previously, garments were manually scanned one-at-a-time, a time consuming process that now will be eliminated. “We’ve been using the InvoTech uniform system for 15-years and it really proved to be efficient and reliable. Knowing our uniform inventory is an important investment, we rely on the system to manage our entire uniform inventory and the employees’ assignments. Now, with the upgrade, we can see how the RFID technology can improve our operations” said Kristina Hunter, Manager of Internal Maintenance and Uniforms at Thunder Valley Casino. The RFID technology allows for multiple uniforms to be processed simultaneously and automatically, and the recordkeeping is also automated. The system integrates with automated uniform conveyors to distribute the uniforms to employees, and to automatically record which uniforms are taken by employees. The InvoTech Uniform System is a paperless “green” system. The System includes an electronic signature capture terminal that records employee signatures when uniforms are assigned, which eliminates the need to print reports to obtain signatures. In addition, all system reports can be viewed on the screen or generated to PDF files to be easily viewed or shared, which also facilitates a paperless “green” system. InvoTech has over 500 of satisfied clients worldwide in more than 30 countries, including hotels, resorts, casinos, theme parks, stadiums, arenas, convention centers, medical centers, cleanrooms, and laundries. Why InvoTech? Because major brands like Hyatt, Marriott, Ritz-Carlton, Hilton, MGM International, Wynn Resorts, Caesars Entertainment, Universal Studios, LEGOLAND, Intel, Pfizer, Madison Square Garden, and Staples Center rely on InvoTech Systems to provide operational efficiency, full-accountability, and turn-key solutions for laundry, linen and uniform management. See what our clients are saying about us. Thunder Valley Casino Resort has been in the elite ranks of AAA Four Diamond award-winning resort destinations since 2011. Located 30 miles east of Sacramento, Thunder Valley Casino Resort offers 250,000 square feet of gaming space – including over 3,000 and video machines, 113 table games and a live poker room with space for 210 players. Thunder Valley has 14 restaurants and bars, including High Steaks Steakhouse, Red Lantern and a 500-seat Buffet as well as Mingle Bar, Falls Bar, Thunder Bar and High Steaks Bar. 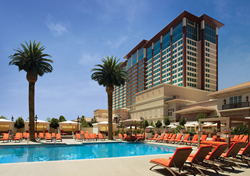 Thunder Valley Casino Resort is also home to a luxury, 17-story hotel with 408 rooms, including 40 suites and an expansive outdoor pool complete with private cabanas and Coconut, a poolside bar. The Spa at Thunder Valley features a wide variety of treatments including the exclusive 24-carat gold leaf facial. Also on property is a 3,700-space parking structure that leads guests directly into the casino and hotel. For more information on upcoming promotions, entertainment and ticket sales, or to make a reservation at Thunder Valley’s AAA Four Diamond resort, visit http://www. thundervalleyresort.com. The United Auburn Indian Community opened Thunder Valley in June 2003.